After a very busy and stressful off-season, it didn’t take Tom Stalba long to find his way into a final round. 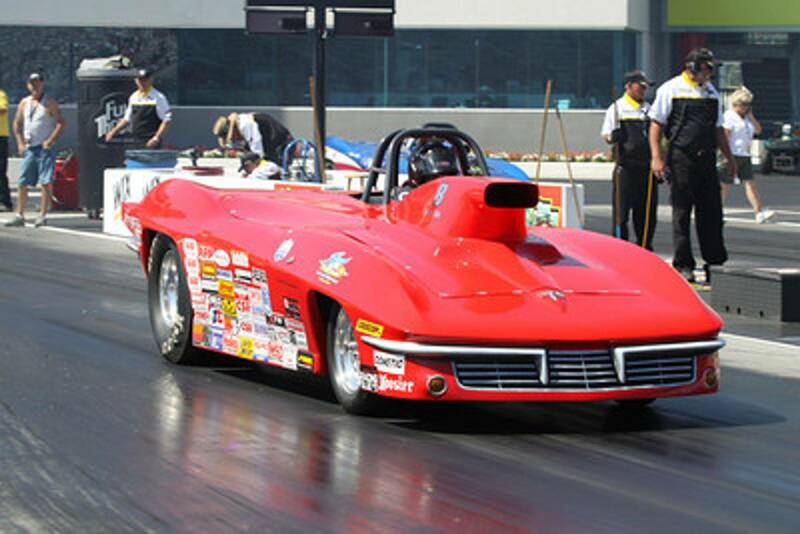 Tom’s season started at the Virginia Motorsports Park NHRA Divisional. After completing time runs, the rains came and washed away the weekend, causing the event to be postponed before eliminations started. Next up was the Maple Grove Divisional, which was nearly completed before the rain came. Unfortunately for Tom, he was waiting in the lanes for his Super Gas Final round opponent, who was very late to the lanes with weather threating. As Tom was ready to roll to the waterbox, track officials shut the pair off because the rain was starting. The final was postponed to the Atco Divisional in August. Since then, Tom has a semi-final finish at the Englishtown Summernationals in Super Gas and a Quarter-final finish at the New England Nationals in Super Gas. Tom just arrived home from the Lebanon Valley Divisional, where he had early exits in both Super Comp and Super Gas, losing 1st and 2nd rounds respectively. The weekend was exhausting due to generator failure and heavy rains. All three Divisional races this season for Division 1 have seen rain of some sort. Tom has not been to as many races as he would to start a season, because he has been very busy with his employees getting ready to open a U-Pull-It parts location to compliment his current auto salvage business. The preparation has required a lot of time for all involved and Tom hasn’t been able to get away as much. That will all change in a few weeks, when Tom’s schedule takes him to New England for a Divisional Race, then off to Atco’s Divisional race, Cecil County, Virginia’s rain make-up, the U.S. Nationals in Indianapolis, and several other races to be determined. Tom and wife Karen have been having a lot of fun with son, Paul, and his drag racing season. Paul is currently the points leader in the Pro Junior Dragster class at Atco Dragway, with 2 wins in 4 finals. Tom and Karen will be with Paul at the Junior Dragster Division 1 Championships in Numidia Pennsylvania in August. IT has been very exciting watching son Paul compete and make new friends at the same time. As always, Tom would like to thank Lucas Oil Products for their continued support and for providing a great product to product his engines. Tom thanks Hoosier Tires for their endless support and encouragement. He also thanks all of the employees at A.A. Auto Salvage who keep the place running and take care of business while Tom is away racing. See you at the track!